Tabriz carpets come almost exclusively from the city itself and the majority are woven in production centers where there are quite a large number of looms. Relatively few Tabriz are made in private households. The loom is vertical, often with metal roller beams. The Turkish knot is always used. The warp is of very strong cotton with a double weft. The pile is of wool, which usually comes from the Maku region (on the border of Turkey). This wool is very strong but rather coarse, with the result that the pile, particularly in medium quality carpets, is uneven and rough. High quality Tabriz utilizes silk and wool and the rare Tabriz are 100% silk. The decoration is floral, often with a central medallion. The motifs – flowering branches, shrubs and leaves – are large. In addition to these classic themes, plant and animal motifs also appeared. Specimens decorated with the Herati motifs are far less common. The border is usually composed of three guards and a main band decorated either with a repetition of the ground motifs or with border Herati. Shirazs are hand knotted on ground looms by the nomadic and semi-nomadic peoples living on the Fars tableland. The warp and weft of these carpets are wool except for some types knotted by semi-nomadic people who use cotton. The weft can be either single or double, according to the tribe, but the pile is always wool. Some tribes use the Persian knot, other use the Turkish knot. In both cases the number of knots per square inch is rarely more than 100. However, it is impossible to be precise about the average knot density of Shirazs because their quality varies enormously from tribe to tribe. 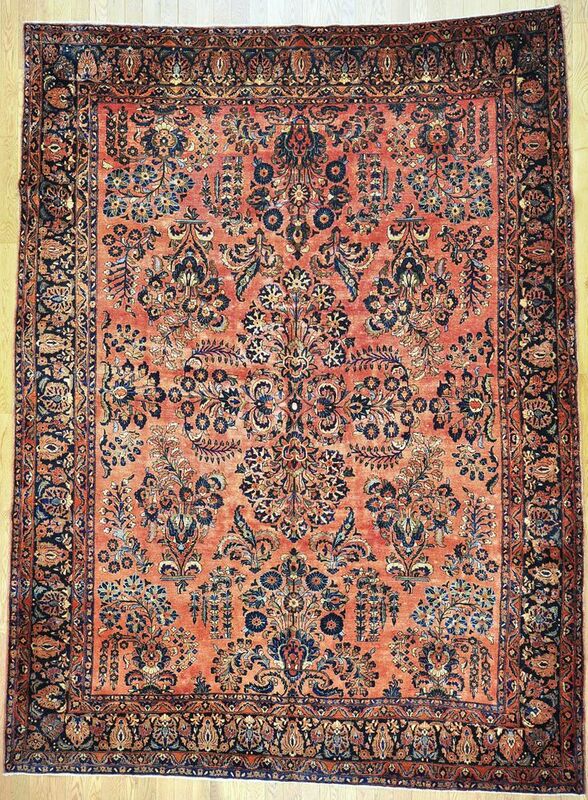 The best Shirazs are those hand knotted by the Arab and Basiri tribes, which are known as Shiraz Extra. Shirazs are typically nomadic in design meaning there are lots of geometric and angular designs. The motifs are simple and executed in bold straight lines and bright colours. The most common motif and one by which a Shiraz may be identified, is the diamond shaped lozenge by itself in the centre of the carpet or repeated along the length twice or three times according to the size. The diamond shape is usually light or dark blue and the field is almost always red and decorated with stylized plant motifs. The border is nearly always made up of a number of narrow bands framing a wider band that is often decorated with a motif resembling palm or pine leaves. The edging bands are often separated from each other by a narrow band of diagonal stripes. Saroughs are hand knotted on a vertical loom using warp and weft in cotton. The weft consists of two or sometimes three threads. In carpets made before the 1915, the weft is pushed down hard against the knots, which made the carpets very compact. The pile is of very good quality wool and is cut very short. However, more recent pieces seem to have deeper piles. The Persian knot is utilized with a density of 160 to 400 knots per square inch. 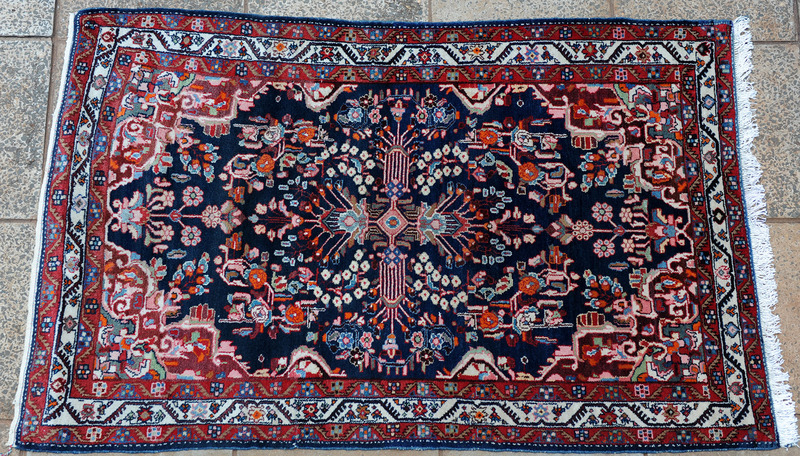 Saroughs may be divided into two categories: carpets with traditional designs and those intended for export, particularly to the United States. The traditional designs consist, for the most part, of the central medallion pattern. The pattern is similar to those used in Kashans, but the different interpretations by different craftsmen give the carpets a special imprint. Although they have floral patterns, this is executed in an angular fashion, resulting in an incomparable fusion of floral and geometric styles. As well as the central medallion, there is also, in old and antique Saroughs, frequent use of the boteh motif. In contrast, the American Sarough (or Lilian) design features large blossoming floral sprays radiating outwards from a central, medallion-like, floral form. It is so named because it was adapted for the American market from a design originating in the village of Lilian; the true Lilian design has a spidery central medallion which American Sarough do not. American Saroughs use either rich rosy reds with blues and paler rose outlining the motifs, or, less frequently, bright pastel shades (usually pale blues, turquoise or lemon yellow), used to create the same strong contrasts between motifs and field as in American Kermans. In all Saroughs the border is simple, almost always consisting of two guards framing a wider central band, which is often decorated with heratis while the former is often of traditional rosettes and wavy line collections. The colour scheme is often a bright orange-red in the field, which is softened by ivory, dark blue, red-brown and dull green. Various shades of turquoise are common in the decorative motifs. Kerman carpets (sometimes “Kirman”) are one of the traditional classifications of Persian carpets. They are named after the city of Kerman, which is both a city and a province located in south central Iran, though as with other such designations the term describes a type which may have been manufactured somewhere else. Kerman has been a major center for the production of high quality carpets since at least the 15th century. 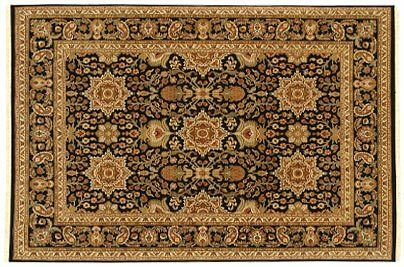 In the 18th century, some authors considered the carpets from the province of Kerman, especially at Siftan, to be the finest Persian carpets, partly because of the high quality of the wool from the region known as Carmania wool. The design pattern of Kerman carpets are also a distinct feature. Vase carpets, a type of Kerman rug distinctive of the 16th and 17th centuries, are characterized by an allover pattern of stylized flowers and oversized palmettes with vases placed throughout the field. Another rare and distinct variation of Kerman carpets is the Lavar or Ravar Kerman. Although Lavar is the improper name, some are still labeled as such. These carpets were produced in Ravar village next to Kerman city in the northern region, and are known particularly for their fine weave and elegant, classically derived design of allover and central medallion formats. Kerman rugs and carpets were woven in all sizes, some extending out to 10 feet. Typical manufacturing used an asymmetrical knot on cotton foundation, but rare examples include silk or part silk piles, or silk foundations with wool pile. Kerman carpets include a signature, either that of the weaver or to whom the carpet was woven for. Borchalus are hand knotted, both the Turkish and Persian knot are used depending on the place of manufacture; they are made with medium-quality wool, and the pile is high. Like almost all carpets from the Hamadan area, these carpets are single-wefted. The warps and wefts are of unbleached cotton. Wefts may be dyed blue. Borchalus are becoming harder and harder to find. They are mainly small to medium sized rugs up to 1.50 x 2.50 M (5 ft. x 7 ft. 3 in. ), also smaller numbers of room carpets, occasionally as large as 3 x 4 m (10 ft. x 13 ft.) as well as in the long, narrow kellegi size that’s usually two or three times longer than it is wide. The carpets of Borchalu arrive on the market via the Hamadan bazaars from the area between Hamadan and Arak. Borchalus are one of the finer knotted types of carpet from the Hamadan region. The designs are heavily geared towards Western taste; central medallions with manifold blossom and other floral motifs, also sometimes drawn as vase carpets, dominate their image. The field is in red or white; the designs in red, blue, gold and green. Azerbaijan has for centuries been known as a center for a large variety of crafts. Archeological artifacts discovered in the territory of Azerbaijan shows a well developed agriculture, stock raising, metal working, and ceramics histories. One of the oldest traditions of the area is carpet-weaving dating as far back as to the 2nd millennium BC. Carpet making began in rural huts and over time became among the most essential arts. The carpets knotted became highly valued by influential figures. The talented weavers were immortalized by poets and documenters of history. Carpet weaving has always been closely connected with daily life in the area. Its role reflected in the meaning of the designs and their applications. Right down to, people seated on carpets in order to tell fortunes as well as used while singing the traditional songs of Novruz, which are the regional New Year’s celebrations. The carpet is widely used in the home for decoration. Special carpets are woven for medical treatments, as well as wedding ceremonies, birthing rituals, mourning loved ones and of course prayer. The Azerbaijani carpet is traditionally handmade of various sizes. Typically they have a dense pile, but sometimes are pile-less. The patterns are very characteristic of Azerbaijan’s carpet-making. Carpet weaving is a family tradition very often transferred through stories and shown by example. Sheep are sheared in Spring and Autumn, while the collected wool is dyed in Spring, Summer and Fall. Construction of carpets is done during the winter months by the female family members, younger girls learning from their mothers and grandmothers. Carpets are constructed on either horizontal or vertical looms. Wools of many colors are incorporated, as well as cotton and/or silk colored with natural dyes. Using unique techniques to create pile carpets, weavers knot the pile yarn around the threads of the warp and weft. While pile-less carpets are variously made by weaving around the structural warps and wefts. When a carpet is finished it’s cutting off the loom is usually a solemn celebration. Jaipur Rugs are handmade carpets made by a company of the same name. Headquartered in Jaipur (India), their operations are located in 10 states of India. They have a network of over 20 branches, as well as an independent weaver base of 40,000 artisans. They are one of the leading manufacturers of handmade carpets in India. K. Chaudhary started the company in 1978 with just two looms and nine artisans. Over the years and under his leadership the company has evolved into one of the leaders of handmade rugs from India. Jaipur rugs are very diverse in appearance. They range from very traditional, often mimicking Persian designs, to Ultra-Modern. This is diversity is one of the major reasons that Jaipur Rugs is an industry leader, as there is something for every décor. The quality also ranges from medium to very fine, and this is due to the large pool of artists knotting the carpets. These smooth rugs are very versatile. Their colours and design suit modern furnishings, and they can be used not only on the floor but as bedspreads, on tables, armchairs and settees, and hanging on the wall. A kelim has even been found useful to cover up an incurable damp patch on a wall! They are hardwearing, and as their appearance is exactly the same on both sides, they can be turned over if the colours on one side have faded, to give wear on both sides. Because they are not as bulky as carpets with a pile, they can be stored, flat or rolled up, in very little space. The Turkish kelims come in two main sizes – 6’ x 4’, the majority of which are prayer designs, and large ones measuring between 12’-16’ long by 6’-8’ wide. The colours of the large Turkish kelims tend to be better than those of the small ones, especially in old examples; this may be because the large carpets got more use, which up to a point improves the appearance of any good carpet, while the small ones used to be kept for dowries and remained rolled up until a marriage could be arranged. These large carpets are generally made in two pieces on two fairly narrow looms, and then sewn together down the middle. The design usually consists of a series of diamond-shaped medallions.